As Democrats Keep Chasing Trump Voter Waterfalls, Will They Ever Listen to Their Actual Base: Black People? Will Democrats ever actually listen to black people in terms of strategy and vote targeting? Can a political party toss over $1 billion into the trash two election cycles in a row? Does it really take a genius to figure out that if a group votes for you 90 percent of the time, you should do what it takes to make sure that group is at the polling place on Election Day? Both Hillary Clinton and Jon Ossoff, a Democrat who ran for Congress out of Georgia’s 6th District and lost, taught us that no amount of money can eclipse the power of votes. Clinton’s campaign spent over $1.2 billion to lose. A harder look at the numbers reveals that blacks stayed home in Michigan and Pennsylvania. And in Georgia, Ossoff spent over $20 million and lost. The hard fact is that the Democratic Party has no history of taking the strategic advice of African-American elected officials, leaders or consultants and applying substantial financial backing to black voter outreach. Will new Democratic National Committee Deputy Chair Rep. Keith Ellison (D-Minn.) be listened to? Who knows. If past is prologue, everyone knows what happens next: Senior black officials asking the party for field help will be ignored, and instead, Democrats will stage a few visits to black churches two Sundays before Election Day, followed by that crash panic of activity days before Election Day. It was white women who gave 53 percent support to Donald Trump. It was Hispanic voters who gave Trump 29 percent of their support. African Americans voted for Clinton at 93 percent. You’d think that lots of energy to get that group out would be common sense after black women were No. 1 in turnout percentage of any voting group. Black women cast a total of 11.4 million ballots, providing the margin he needed to win. This past November, even with a clear lack of voter mobilization investment and a decrease in overall Black voter turnout, 94 percent of Black women voted to keep this country moving forward by casting ballots for Hillary Clinton. Shouldn’t that be obvious? Black turnout dove to 2004 levels in 2016 after Democrats decided that the record numbers seen in 2008 and 2012 would magically persist without President Barack Obama on the ticket. On June 28, Perez met with many of the group of black women who wrote to him about black-voter outreach. The results were predictable: general talk of “a good beginning” and “give us a plan of action and we’ll meet again.” Even when presented with a clear list of demands and long-standing data to support the importance of the black vote, Democrats still place their focus elsewhere. There were over 130,000 African Americans in South Carolina’s 5th Congressional District. Did the Democratic Party attempt to make a vigorous effort to turn them out? No. More than 90 percent of African-American voters vote for the Democratic Party. Rep. Jim Clyburn (D-S.C.) asked for $200,000 to get out that vote. The answer was no. On June 22, The Root asked Clyburn if he could remember a time when the Democratic Party has listened to blacks on strategy. “I haven’t really thought about that,” said Clyburn, with a smile in an ornate lobby off of the House floor. “But they didn’t this time,” he added. Clyburn will turn 77 next month and has been in Congress since 1993. If Democrats in charge of strategic decisions aren’t listing to him when it comes to black-voter outreach, who are they listening to? Speaking with several other senior black Democrats reveals the same scenario. “Every dollar spent wooing Republicans is money flushed down the drain,” stated Steve Phillips of Democracy in Color on the Georgia 6th Congressional District race. Phillips is urging the Democratic Party to focus on its base and not Trump’s “white working-class voters” who have become the party’s obsession. Let’s see if anyone listens going into 2018. Or will there be another “billion-dollar blunder,” as Phillips defined it, like in 2016? Democrats have lost over 900 state legislative seats since 2008. They lost 63 U.S. House seats in 2010, along with six U.S. Senate seats. The same decision-makers then are the same now. You’d think that all that losing would prompt a rush to listen to other strategies coming from Steve Phillips or Cornell Belcher. Republicans know the numbers and understand that their road to victory includes making it harder for members of the Democratic base to vote. Where’s the DNC’s anti-suppression campaign? 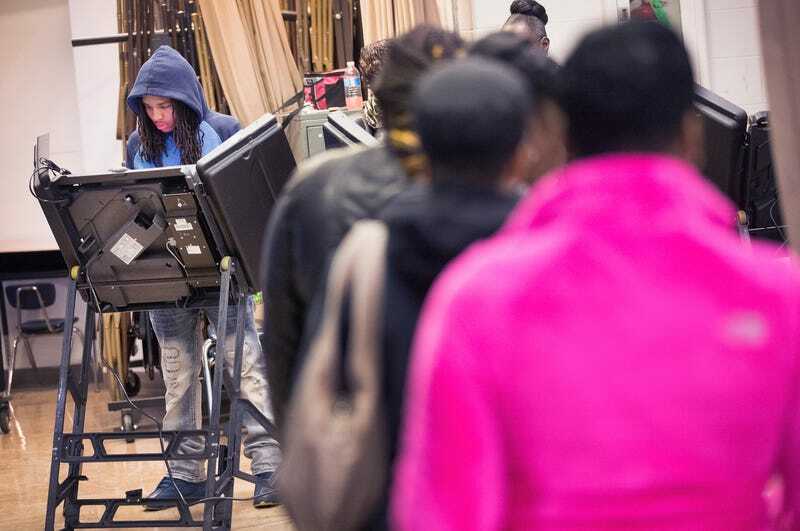 Where’s the get-out-the-vote effort to target black voters? Where’s the census strategy? “We have to raise our own money and make our own decisions,” said Congressional Black Caucus PAC Chair Greg Meeks (D-N.Y.) as he walked to the CBC’s weekly meeting the day before. That’s an understatement. Democrats are proving cycle after cycle that you can have all the money in the world, but if you’re a loser on messaging and vote targeting, it’s a waste. Democrats fell asleep on their local state legislature strategy. And the GOP was able to carve up more Republican seats after the 2010 census. There have been recent efforts to control the game. New efforts like The Collective and Higher Heights have specifically targeted African-American candidates as young activists get tired of waiting for the Democratic Party to confront the reality of the new American majority. It won’t take long to find the answer.